We've all heard the arguments of the religious and political right-wing on the Israeli-Palestinian conflict. Filled with finalities and absolutes, they categorically rule out options, deny possibilities, and imply that believing otherwise is naive, foolish, and irresponsible. They argue that pro-Israel can mean only one thing: endorsing their hard-line views. Americans for Peace Now rejects this approach. We know that pro-Israel does not mean blindly supporting policies that are irrational, reckless, and counter-productive. Pro-Israel means supporting policies that are consistent with Israel's interests and promote its survival as a Jewish, democratic state - policies such as making peace with Egypt and Jordan, and pursuing peace with Syria and the Palestinians. And we know that ill-conceived extremist schemes - like filling the West Bank and Gaza with settlements - have cost (and continue to cost) Israel dearly. If you would find it easier to read it straight through (like a book), click here for a pdf version. Why should the U.S. care about Israeli-Palestinian peace? Why should we be worried about Israeli democracy? Why Should Israel have to give up land? What About Jerusalem and Hebron? Does more land mean more security? What About Hamas and Gaza? "It is impossible to make peace with Arabs or Muslims." "Israel's security is more important than any peace agreement." "The Arabs' conflict with Israel has nothing to do with territory." "Let the Arabs accept Israel first. Only then should anyone ask Israel to make peace." "Peace with the Arabs is impossible as long as they continue to teach their children to hate Jews and to kill Israelis." "Arabs don't "deserve" peace because of their negative attitudes toward Israel." "Political agreements with Arab leaders are worthless." "Israel was right to reject the Arab Peace Initiative (API)." "Israel should stop worrying about the Palestinians and focus on the Arab world." "Iran is an existential threat to Israel, and all its leaders understand is sanctions and the threat of military action." "Israel can't trust any Muslim country to act as an ally. Look at what has happened with Turkey." "How can Israel be expected to negotiate with the Palestinians if the Palestinian leaders refuse to recognize Israel as Jewish state?" "Why do Israelis and many supporters or Israel insist that Israel should be recognized as a Jewish state?" "Why is the demand that Israel be recognized “as a Jewish state” a problem for the Palestinians?" "Is there any way to reconcile the Israeli and Palestinian positions on the recognition issue?" "Why is the Left obsessed with the two-state solution?" "Why can't Israel keep all the land?" "The majority of Jordan's population is Palestinian. If Palestinians want a state, let them go to Jordan, and likewise, let Egypt take over Gaza." "Why should the settlers leave? Why can't the current situation continue more or less as it is, at least until a peace agreement is a more realistic possibility?" "Some problems simply can't be 'solved.' Some things are just too complicated to be fixed and the only solution is to just live with the problem." "Maybe a solution is possible, but it is clearly not going to happen anytime soon, because the Palestinians and Arabs don't want it. It's time to stop pushing Israel to make concessions and to stop pressing Israel to engage in peace efforts that are clearly pointless." "For now, the best we can hope for is "economic peace" -- where the focus is on improvement in the living conditions of Palestinians, not a political agreement to end the conflict." "The U.S. can't want peace more than the parties themselves." "There is no linkage between Israeli-Palestinian peace and U.S. national security." "If the Left were serious about being pro-Israel, it would spend more time supporting aid to Israel and less time criticizing Israeli policy." "U.S. taxpayers shouldn't be asked to send money to the Palestinians." "Why does the Left oppose Israel’s 2016 NGO Transparency law? Transparency is a good thing – unless you have something to hide." "There is nothing discriminatory about an effort to make the funding of NGOs completely transparent." "Israel’s 2016 “NGO transparency” law is no different than FARA." "An Israeli organization that accepts foreign government funding is an agent of that government and should be named and shamed as such." "The Israeli Knesset was democratically elected. There is nothing anti-democratic about this body adopting a law that merely compels Israeli NGOs getting foreign government funds to be more transparent." "The Left and other anti-Israel forces are hysterical about this bill for no reason – just as an excuse to attack Israel and hurt its reputation." "All the doom and gloom about the health of Israeli democracy is just an excuse for the Left to criticize policies that were democratically adopted." "All democracies have problems. Israeli democracy isn't in crisis." "Any democracy is imperfect. The Left is exploiting problems to criticize Israel and promote its own anti-settlement agenda." "There are two sets of laws in the West Bank – one for settlers and one for Palestinians"
"US Ambassador to Israel Daniel Shapiro should apologize to Israel, a nation that respects the rule of law, for saying Israel has a double standard in law enforcement against Jews versus against Palestinians"
"It's the Arabs' own fault they lost land. If the Arabs hadn't attacked Israel in 1967, Israel wouldn't have been forced to fight for its survival, in the process taking over the land the Arabs now demand." "Judea and Samaria (or as the Left would say, the West Bank) and Gaza cannot be 'occupied' because they never belonged to any other sovereign nation." "The West Bank, Gaza, and the Golan Heights are 'disputed', not 'occupied.'" "The Gaza experience proves that land for peace doesn't work." "The Palestinian drive for international recognition of a state outside of negotiations proves they aren't serious about peace." "Jerusalem is the heart and soul of the Jewish People. Israel cannot give up an inch of this holy city to the Arabs." "Jerusalem is the eternal undivided capital of Israel. It cannot ever again be divided." "Jerusalem is the capital of Israel and only Israel. It cannot also be the capital of another state." "Jerusalem belongs not just to Israel but to the entire Jewish people. Israel cannot negotiate the future of Jerusalem without the approval of Jews everywhere." "The U.S. Embassy in Israel should be moved immediately to Jerusalem." "Why does the Left protest when Israelis buy property in East Jerusalem?" "Israelis and Palestinians can buy property in East Jerusalem. Why is that a problem – unless you are in favor of discrimination against Jews?" "Why shouldn’t Palestinians be able to sell property in East Jerusalem to Jews if they want to? Again, what is the problem – unless you are in favor of discrimination against Jews?" "It is religious discrimination to say that Jews can’t pray on the Temple Mount, but Muslims can." "Arabs can live anywhere in Jerusalem; Jews should likewise be able to build and live anywhere in the city." "Arab claims to Jerusalem are flimsy." "Hebron belongs to the Jews." "The Jewish return to Hebron after 1967 is nothing more than justice." "Why shouldn’t Israel be able to build in areas that everyone – including the Palestinians - knows Israel will keep in any future peace agreement?" "Palestinians act as if settlements are everywhere, but the truth is that most of the West Bank - the historic heart of Eretz Yisrael - is still in Palestinian hands. All Israel really insists on keeping is the major built-up areas, the settlement blocs." "The U.S. should get Israel to agree to limit settlement activity to construction inside the blocs only." "Why does the Left oppose construction in settlement blocs?" "The term 'settlement bloc' merely describes an objective reality on the ground." "Keeping settlement blocs is necessary for Israel’s security." "Even the Palestinians know that settlement blocs are going to become part of Israel." "If Israel stops building in settlement blocs its just rewarding anti-peace and anti-Israel extremism like BDS." "American Jews have no business telling Israel not to build in the settlement blocs." "The Left is obsessed with settlements. Clearly this is just an excuse to bash Israel." "Settlements are not an obstacle to peace. They take up only a tiny fraction of the entire West Bank." "Construction inside settlements is not expansion." "Settlers, have the right to have babies and homes of their own. Demanding that all construction in settlements stop violates these universal rights." "Israel should annex Area C"
"Israel should act unilaterally to preserve its own interests... for Israelis living in parts of the West Bank that everyone knows Israel will never give up""
"Settlements aren't an obstacle to peace. The only real obstacle is Palestinian unwillingness to negotiate and compromise." "Making a big deal about settlements unnecessarily foments discord between America and Israel." "Removing settlements and outposts in the West Bank won't satisfy the Arabs and bring peace." "Settlements are Israel's first line of defense against attack. Sacrificing settlements to appease Israel's enemies will only invite aggression." "Arabs live in Israel. Settlers should be able to stay where they are, even under a peace agreement." "Those calling for the removal of settlers are arguing for an openly anti-Semitic policy of ethnic cleansing." "Asking Israel to give up land is asking Israel to sacrifice its security." "Israeli national security needs dictate that Israel retains all or most of the West Bank." "If the IDF withdraws from the West Bank, the West Bank will become a haven for terrorists and Israel could easily be attacked by rockets and mortars." "When it comes to Israel's security, Israel can't trust anyone else, especially not the Palestinians." "The only thing preventing the West Bank from turning into another "Hamastan" - like in Gaza - is the presence of the Israeli military." "Criticizing Israel over its blockade of Gaza is wrong." "Palestinian 'reconciliation' is just code for letting terrorists into the government." "Why does the Left criticize Israel for its policies and actions on Gaza?" "Eventually, Israel can and will defeat Hamas and force them out of Gaza." "All BDS – whether targeted at Israel or at settlements – is anti-Israel, anti-Semitic, and unacceptable." "The only way to fight BDS is to attack its proponents and supporters – to call them out as anti-Israel and anti-Semitic, to name and shame – and to pass laws banning boycotts and other economic pressure against Israel"
"There’s nothing unconstitutional about banning BDS." 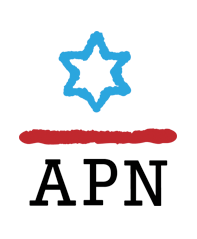 "APN claims to be pro-Israel but all it seems to do is criticize the Israeli government." "Why doesn't APN support boycotts and divestment efforts targeting Israel?" "Jews shouldn't boycott other Jews." "By embracing boycotts, the Left is contributing to the momentum behind the BDS movement and to the delegitimization of Israel." "A boycott of settlements is not only politically misguided but also pointless." "Why does APN differentiate between boycotts and similar efforts targeting Israel and the same kind of efforts targeting settlements and/or the occupation?" "What about boycotts and divestment efforts targeting the occupation? Isn't this just another pretext to delegitimize and attack Israel? " "Criticism of Israel, even by people who claim to support Israel, only feeds the global campaign to delegitimize Israel. Public criticism of Israel has to stop." "What is the Left's obsession with bashing Israel?" "Why doesn’t APN support calls to cut aid to Israel?" "The Palestinians are just Arabs from other places who settled in the land of Israel over the years, They were never a real people with a cohesive national identity." "Palestinian nationalism was never the real issue." "Palestinian nationalism is a modern invention. Jewish nationalism dates back to the times of the bible." "There are 21 Arab States. There is one Jewish state. If Arabs aren't happy living under Israeli authority, they are welcome to go and make their homes among other Arabs." "If people really cared about the Palestinians, they'd have found homes for the so-called 'refugees' rather than forcing them to stay in limbo year after year." "There is no Palestinian refugee problem - the problem is the UN." "If the Palestinians were treated like any other refugee population on earth, the refugee issue would have disappeared years ago." "The Palestinian demand for the 'right of return' is nothing more than a veiled call for the destruction of Israel by demographic means." "The Palestinian refugee issue gets a lot of attention, but an even bigger issue, that of Jewish refugees from Arab countries gets ignored." "The torah explicitly says that God gave Israel to the Jewish people." "Based on the teachings of the Torah, it is clear that the land of Israel was given to the Jews by God and should never be negotiated over or given to non-Jews." "Based on the teachings of the Torah, the Jewish people are obligated to conquer and take possession of all the historic Land of Israel and are forbidden to cede any of it to a non-Jew." "Based on the teachings of the Torah, the Jewish obligation to live in the land of Israel means that Jews who live outside the land of Israel have no right to criticize the actions of those who do."